After a long winter and tepid spring, summer is finally knocking on our door. The weather is beautiful, but don’t forget to prepare your home for the summer heat and thunderstorms. 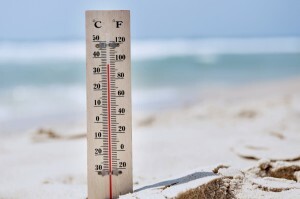 These quick tips will help you prepare for the worst while enjoying the best summer has to offer. Let the light in! Winter wear and weather can dirty your windows and reduce the amount of light they let in. A simple cleaning can help make your windows look like new! We suggest mixing a water and white vinegar solution in a spray bottle, squirting it on your windows and letting it sit 15 minutes before wiping it off. After that, just give your windows a simple cleaning with a glass cleaner and enjoy the results! Summer is almost here, but it won’t last long. Break out that patio furniture early and enjoy every minute you can in the beautiful summer weather. There are few things in the world better than homegrown vegetables… so why not grow some? Planting a garden with flowers and vegetables can help make your home look beautiful and can even help shave some costs off your grocery bill! Getting started is easy, daily maintenance is minimal, and the results are d-e-l-i-c-i-o-u-s. Checking your AC system each year around this time can help extend its longevity, enhance its efficacy, increase air quality, and save you money on your monthly utility bills. Clean dirt and debris away from your outside condensing unit; then wash or vacuum all cleanable filters and replace all disposable filters on the inside unit. Gutters provide a pivotal role during the summer rains by washing water away from dangerous areas of your home. If you have clogged or leaky gutters, rain water will drip off your roof and erode the land underneath, which could lead to basement leaks or floods. Check and fix your gutters to avoid this potential disaster. Ceiling fans help keep your house from getting stuffy, and will also help cool a room dramatically without the use of air conditioning. Make sure your blades are facing downward to allow your fan to give the room a nice breeze. Although this might seem like the last thing on your priority list, it can help cool your house significantly. When the summer heat reaches 90+ degrees outside, an attic can easily reach up to 140 degrees! A cooler attic will help pull hot air off your ceiling and can take some of the burden off your AC unit! It’s now officially grilling season! All that grilling last year might have left your propane tank near empty. Don’t wait until your tank is empty to refill it. Refill early and grill away! Excellent, wonderful goods guy. I am just an enthusiastic fans. Keep it up.